For me, when I go to choose a nail polish, 9 times out of 10, I’ll choose red. There is something so simple, yet alluring, about red polish – which is why I love it so much! 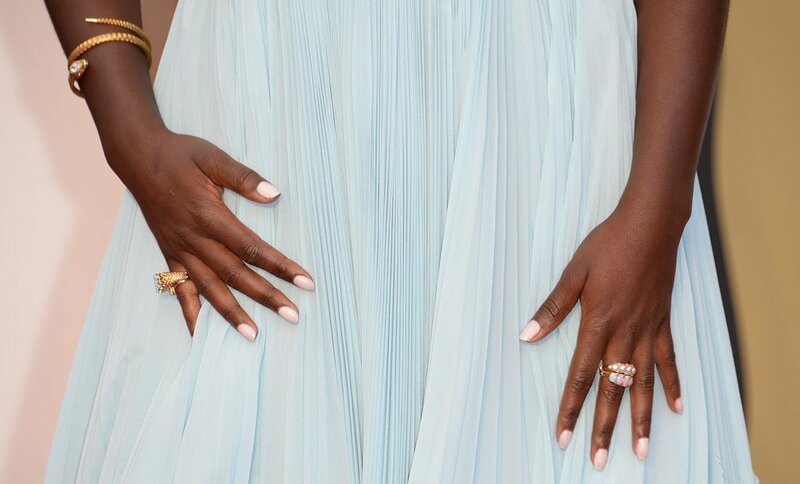 so why not look to our fellow celebs for some manicure inspiration. Below are some lacquer-inspo’s from this years red carpet’s to get you all out of your comfort zone and trying something new! Which colours are you wanting to try?? 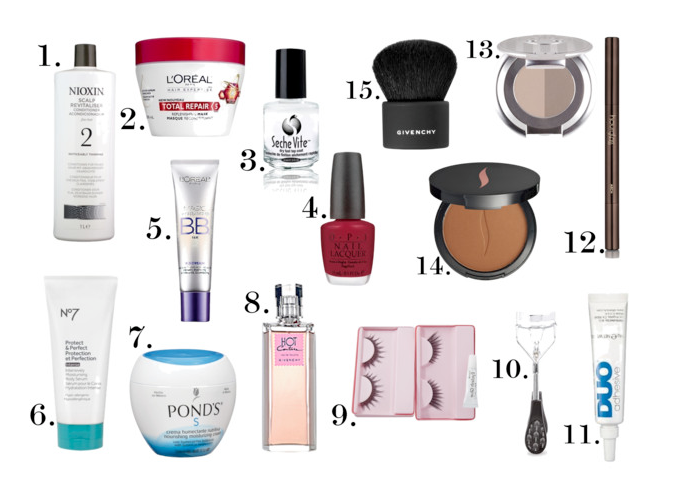 Hey guys, so I thought I would give everyone some insight as to my favourite and most used beauty products from 2013. I personally don’t really wear a lot of make up during the week (call me lazy), so the majority of this list are essential products, most of which I discovered last year, and now I can’t live without! 1. Nioxin – This shampoo has been my hair’s life saviour. Each shampoo ranges in numbers, from 1-5. Each number is based upon the thickness or treatment in which applies to your hair. I use the number 2 shampoo and condition (for fine hair). It literally has to be one of the best shampoos I have ever used. My hair still smells amazing even after I straighten it! Not to mention it has thickened my hair, and no longer looks dull. This shampoo is a little on the pricey side, ($60-80) but you can find it at Homesense or Winners for half the price. 2. L’Oreal Paris Total Repair Replenishing Mask – All of my girlfriends know that this is by far my favourite hair product. They all refer to it as my ‘hair crack’ because I literally can’t go without it. Ranging from $4-6 dollars, you get way more bang for your buck! This product has made my hair the smoothest and shiniest it has ever been, and I always get compliments because of it! It can be found at Wal-Mart or Shoppers Drug Mart. 3. Seche Vite – The best top coat I have ever used. Leaves your nails smooth and shiny, and literally is resistant to just about anything that touches your nails. Once you go Seche, you never go back! Can usually be found at any beauty supply store, sometimes at Winners. Ranges in price from $9-15 dollars. 4. OPI: Got The Blues for Red – OPI is the only nail polish I’ll ever use, I find it has the best brush and glides on the easiest. This colour has been my go-to red for the past year, and I don’t think it’ll ever change! Sells on average for $8, and can usually be found at any beauty supply store. 7. Ponds Face Cream – Introduced to me by my grandmother (heading towards the age of 70, and still looks 45) might I add, is literally the best face cream ever. I know that’s a bold statement, but I’ve suggested this cream to every single one of my girlfriends and now they all swear by it! It is a thick cream, so if you want something light, I wouldn’t suggest this one – but it is perfect for completely revitalizing and replenishing the moisture back into your skin! Ranges on average for $5-8, and can be found at Wal-Mart, Target, or Shoppers Drug Mart. 8. Givenchy Hot Couture – If you like a sweet smelling perfume, and love to receive compliments on how great you smell just about everywhere you go, this is the perfume for you. I used to use this perfume back in high school, and just recently jumped on the bandwagon again, and now I can’t get enough! Ranges on average $80 for the 50ml, and $100 for the 100ml, and can be found at Shoppers, The Bay or Holt Renfrew. I hope you guys go out and try these products, they’re all amazing! When you do, let me know what you think! !